Reading the Qur’an can result in mental discord regarding a certain subject. A ruling on a certain matter may contradict our egos. Certain memories or past experiences may cause a sudden loss of faith. No matter what the excuse, we may very well be able to convince ourselves that we have no need for God. Regardless of our current circumstances, perhaps our souls do not want to take on the burden of religion. If we are not ready to make an effort and to struggle to reach the truth, we become susceptible to the loss of or decrease in faith. This is a common problem when there is a lack of information or knowledge. When the topic is religious beliefs the situation becomes much more serious since religious beliefs dictate the values by which we live our lives. These basic values are the starting point and major determinant of our preferences, world-views, personalities and behavior. Should these beliefs be able to be molded and adapted as we wish or should they come from the truth? One's basic beliefs can be determined either by submitting to the universal truth or by tailoring the truth in order to suit oneself. A person who selects the first option builds his own being in accordance with this universal truth. In contrast, those who pursue the other option should be prepared to be disappointed at any time since the truth will not change according to a person's wishes. The Holy Creator, who created the universe, did not just abandon us in this area of existence. It is evident that people who deny the Creator's existence imprison themselves in a cell of loneliness which is, in fact, from a psychological and philosophic perspective, a form of torment. If we are not ready to make an effort and to struggle to reach the truth, we become susceptible to the loss of or decrease in faith. This is a common problem when there is a lack of information or knowledge. From the first day of our creation, our Creator, who has never abandoned us or left us alone to face this monumental truth which is beyond our understanding, informed us about the existence of an indefinite and profound truth through the messengers that he has chosen. Also, because of the Creator's confidence in us and the value he has given us (in contrast to the non-human beings), he left the decision of whether or not to submit to the truth to us. Commonly, memories or experiences are used as excuses for not following the divine truth or a person's own perception of happiness and tranquility is preferred over Allah's; this is an egoist approach. Sometimes, because it becomes difficult for us to follow the commandments of the religion, we prefer to be consoled with the comforts of the material world. Interpreting Allah's religion ourselves, without taking the Qur'an into consideration, or insulting Allah or His Messenger will prevent us from experiencing Allah's mercy on Judgment Day. If we are presented with a divine revelation that is difficult to accept, we should approach this manner in this way, saying to ourselves, “I cannot comprehend this, but it must be true since Allah said it.” In this way, we are not changing Allah's words or denying them or pretending they do not exist. Even if a person does not fulfill certain duties, if he accepts that these duties are conferred on us by Allah and confesses to not fulfilling them, he is still a Muslim. However, if a person starts to, like a god, distinguish between right and wrong, the ontological connection with religion shuts down. Even if a person does not fulfill certain duties, if he accepts that these duties are conferred on us by Allah and confesses to not fulfilling them, he is still a Muslim. However, if a person starts to, like a god, distinguish between right and wrong, the ontological connection with religion shuts down. IS THERE ONLY ONE WAY TO LIVE ISLAM? The truth can be compared to an enormous crystal which everyone looks at from a different angle. Some people may look at it as a whole while others, for a variety of reasons, may only be able to see a portion of it and believe that that portion is actually the whole crystal. There is only one truth; however, each of us does not convey the message of this truth with the same strength. For example, the companions of the Prophet, who were able to see and spend time with him, were able to convey the truth in a more convincing way. Based on this, it is clear that there is not a single standard way to convey the truth; there are differences, and unless a person denies Haq (the truth), he is within the circle of truth. The differing degrees in which one implements Islam into his life can be visualized using a staircase. Some people are at the top of the staircase while others are at the bottom. They are united by the fact that they are all on the staircase. While climbing the staircase, we are following those who are more towards the top. This analogy can be applied to the level one implements the practices of Islam into his life. Hassan ibn Thabit, one of the companions of Prophet Muhammad, was a great poet, and whenever someone attacked the Prophet in a poem, he would respond on behalf of the Prophet. He requested permission from Prophet Muhammad to not participate in the Battle of the Trench so he could stay behind with the women. He is still referred to as the “Poet of the Prophet” and there are reports that Prophet Muhammad gave him one of his sweaters as a present. Even though the Prophet advised the women not to join the army, some women from Medina, after hearing that the Prophet's army had been defeated in the Battle of Uhud, grabbed all weapons they could carry and ran to the battlefield and the Prophet did not criticize their response. These stories indicate that society is composed of a variety of different people, all of which are needed, such as soldiers, writers, housewives, and artists. While these people have different characteristics, experiences and lives, as long as they accept Haq, they can be considered as part of the circle of Islam. To correctly understand and interpret Islam today, detailed knowledge of the first years of Islam is necessary. The concepts and practices that are difficult to understand in today's world were implemented for a purpose at that time. Understanding the details of the Prophet's life helps to make such things easier to understand.Following such a study, it becomes evident that there is room in Islam for a variety of different people, both those who are strong as well as the weak. All of these people have the ability to be good Muslims. Being a good Muslim means submitting to Allah and not following any other way other than the way of Allah and His Messenger. To correctly understand and interpret Islam today, detailed knowledge of the first years of Islam is necessary. The concepts and practices that are difficult to understand in today's world were implemented for a purpose at that time. Understanding the details of the Prophet's life helps to make such things easier to understand. The Qur’an is the direct word of Allah. This includes both its words and the meaning of the verses in this holy book which is the last revealed word of Allah. The Qur'an was sent by Allah to humanity via Prophet Muhammad who is the one who carried, revealed and provided guidance and examples of how to implement the words of Allah. The miracles of this book can be categorized into two main branches: language and meaning. With regard to its use of language and wording, the Qur’an is a miracle. It by far surpassed the works of the master poets of its time. During that period, when literature and poetry were at a peak, even people who did not believe in the Qur'an accepted its literary achievements. This then begs the question of why one who admires the literary aspects of the Qur'an does not believe in its veracity. However, being impressed by the literary beauty of the Qur'an does not necessarily make one believe. In order to submit to Allah and the words in His book, one must also purify himself and his soul from arrogance, addiction to material items; in short, from all negative feelings. One should endeavor to place Haq, the truth, above all other selfish desires. 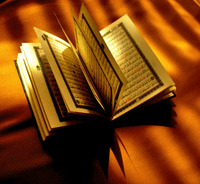 In addition, the Qur’an is a miracle with regards to its meaning. Centuries after it was revealed, the remarkable features of the Qur'an have become even more magnificent. As time passes, man slowly deciphers the secrets of the universe. Thus, the meaning of some of the phrases and verses in the Qur’an have just been grasped. Particularly the verses which explain scientific facts could not be understood using the knowledge that mankind had accumulated at the time when the Qur'an was revealed. Recent scientific discoveries continue to reveal the miracles in the Qur'an which was sent to humanity fourteen centuries ago. As opposed to all other creatures, Allah, who created beings out of nothing, created the human being with the freedom to make choices. However, in order to prevent the negative consequences of this freedom, Allah did not neglect to guide humanity. The Qur'an, which Muslims believe is the direct word of Allah, does not just contain the truth, it also details the natural laws of the universe, thus making the Qur'an universal. The fact that the Qur’an is universal means that it is valid in all times and places. Even if some of the realities of the laws of the universe do not please us, this does not change the fact that they are all true. The fact that the Qur’an is universal means that it is valid in all times and places. Even if some of the realities of the laws of the universe do not please us, this does not change the fact that they are all true.Whether we want it to or not, the universe continues to exist within the realm of those rules. The same applies to the Qur’an as well. It also reflects the past (starting from the first moment of creation), the present, and the future (after the annihilation of the world) using clear, vivid and precise wording. However, it leaves the choice of whether to comply with this truth to individuals. Claiming that the main ideas and the expressions in the Qur'an belong to a certain period of time, or, in other words, saying that the Qur’an is a historical and thus outdated manuscript is an attempt by human beings to make room for themselves. Such a claim is a means to favor the relative truths that have been reached using the limited brainpower of humans rather than the universal truths of the Qur’an which must be more important than personal pleasures and indulgences. Placing oneself before everything means that the truth will be shaped based on one's own opinions in which case the actual truth is brushed aside. Sometimes, especially in societies which are not ruled by Islamic law, a law or ruling stemming from the Qur’an may seem impossible to apply due to the limitations of individuals as may be the case when inheritance is distributed in accordance with religious rulings in a family where the rights and responsibilities were not formed based on religion. In such cases, instead of ignoring the rule and considering it to be an inapplicable historical ruling, a fatwa (non-binding legal interpretation of the Sharia) that is specific to the conditions of today can be applied as this will both prevent the individual from being victimized and avoid any attempts to not follow the provisions of the Qur’an. Islam is the only religion in the world with a holy book that has not been touched by the human hand. Acknowledging this is not only the duty of Muslims but also of humanity as a whole. Objecting to the universality of the Qur’an just because it does not comply with our self-imposed borders and picking and choosing from the Qur'an in order to fit into these borders is definitely going too far. Many people complain about the decline of Islam and religion and society while at the same time trying to mold Islam and the Qur'an in a way that suits this age. This paradox, which stems from the fact that people do not want to or will not let themselves submit to the will of Allah, results in a dilemma. For these reasons, it is crucial that the Qur’an not be interpreted in such a way that the meanings of the verses go beyond what is accepted by the majority of scholars. In the Qur’an, even the anecdotes which seem to be purely historical have a deeper meaning. A successful reading and interpretation of such anecdotes results in examples and guidance on many of life's important issues. Touching upon the issues of the unchanging nature of human character, social interaction, the characteristics of atheists and believers, the reasons that lead to people swearing, etc., many anecdotes in the Qur'an actually provide up-to-date examples on problems that are still relevant today. A person who is more knowledgeable about the Qur'an and hadiths tends to try to process them, implementing what is learned from them in his life, whereas a person with little or no knowledge tends to ignore such things. Of course, the approach a person takes towards the Qur’an is important as well. How two people read and interpret the same verse can be very different. One may read it trying to find approval for his behavior while the other may read it with the goal of comprehending Allah's timeless message; these two people will obviously have quite a different understanding of the religion. Moreover, the provisions revealed were sequenced in such a way so society could easily and properly implement them, making the provisions that were to be revealed next easier to accept and understand. The Qur’an was not revealed to Prophet Muhammad all at once. Rather, it was revealed over a period of twenty-three years a little at a time. Sometimes just a verse was revealed while at other times several verses, or a surah, were revealed together. One of the reasons for this method was to actualize the divine inducement or guidance that fulfilled the needs of the society based on the incidents that had occurred. Another reason was to slowly prepare society for the provisions next to come. Examples of this include the prohibition of drinking and interest as well as the ritual prayers (salah), which was the first religious obligation placed on Muslims. Performing the ritual prayers can be viewed as the core of the religion which facilitates the implementation of other practices and the actualization of religion in one's personal and social life. A person who starts to perform the ritual prayers properly and gives importance to the prayers is usually more willing and prepared to implement the other religious practices. After the introduction of the ritual prayers, other provisions were slowly revealed so that the mental and emotional training necessary for faith, commitment to Allah and the Prophet, a sense of belonging to the Muslim society and belief in the afterlife as the major motivation for life continued. Thanks to this training, the small community around the Prophet, his companions, reached a level where they accepted all the information relayed to them by Prophet Muhammad, which had come from Allah, and the practices that were necessary to implement this information. Moreover, the provisions revealed were sequenced in such a way so society could easily and properly implement them, making the provisions that were to be revealed next easier to accept and understand.Before interest was prohibited, provisions related to social justice, such as zakat (charity), lending without intending to make a profit (qardul hassan), etc. were placed within the society in a fully-organized system. Similarly, before adultery was prohibited, marriage was made easier and the rules regarding the proper relationship and behavior between males and females were taught and adopted as religiously necessary. These rules were accepted as the natural consequence of religious belief. Thus, this method should be taken into consideration in the duty of inviting others to Islam (da'wah), which is also the responsibility of Muslims. Of course, there is also a sequence that should be followed during the process of educating someone; such a process is an essential condition in every type of education. It is obvious that mentioning the provisions of Islam and encouraging the implementation of the practices to someone whose faith is not properly placed, has doubts about the truth of the Qur’an, does not trust the Prophet's explanations of the Qur’an, or who considers afterlife to be a vague possibility will not be very effective. The life of Prophet Muhammad and the order in which the verses in the Qur'an were revealed and how these topics were explained by the Prophet should be taken into consideration and used as instructive material when performing da'wah. After all, it is neither possible to comprehend Islam nor to accurately present Islam to others without knowledge of the details of the life of Prophet Muhammad. Muhammad Hamidullah’s book Introduction to Islam is an essential piece which provides a helpful and systematized outline of Islam useful for both those learning Islam as well as those teaching it. This book was written for the purpose of introducing Islam to Western societies. Regrettably, today Introduction to Islam is also used in Muslim countries where knowledge of Islam is lacking. In his book, Hamidullah first explains the life of the Messenger of Allah of Islam as without having knowledge of the life of the Prophet (sira) it is not possible to fully comprehend the interpretation of the Qur'an, Islamic law or the hadith. Without this knowledge, information about the religion would have no context. In order to give this information some context, it is necessary to be familiar with the life of the Prophet, how each verse was interpreted and put into practice and how these practices should be observed in daily life. All the prophets emphasized that they personally did not create anything and had been sent by Allah. Throughout history, various battled threatened to erase the divine messages sent by Allah. This is true for all the prophets before Prophet Muhammad. The messages they carried disappeared and their experiences were mixed with myths and stories created by humans. When discussing the prophets, these two facts should not be forgotten. Again, looking at the history of religion, it is evident that due to their communication with Allah, some prophets accepted as messengers between men and Allah were idolized throughout history. Awareness of this incident in the history of prophecy can prevent it from happening again. As Muhammad Hamidullah states in his introduction, all aspects of religious life stem from three basic principles: God, the Prophet and belief in the Afterlife. While learning about Islam, teaching the religion, and inviting others to it, sound knowledge of these principles is key. For more information on this and related topics, the topics of Modernism and Islam and the Modernist Interpretations of the Qur’an should be examined. Fatma Bayram is a Turkish writer and Islamic educator based in Istanbul. Please type '647' into this field.